PLEASE NOTE BAR-I IS A BAR INVENTORY TECHNOLOGY AND SERVICES COMPANY. WE DO NOT SELL OR INSTALL DRAFT BEER EQUIPMENT. WE HAVE WRITTEN THIS BLOG AS THE MAJORITY OF OUR CLIENTS SERVE DRAFT BEER AND WE HAVE SEEN FIRST HAND HOW THE DESIGN OF DRAFT SYSTEMS HAS A SIGNIFICANT IMPACT OF DRAFT BEER YIELDS AND PROFITABILITY. THE PURPOSE OF THE ARTICLE IS TO SHARE THAT KNOWLEDGE SO YOU CAN MAKE SMART DECISIONS WHEN INSTALLING OR UPGRADING YOUR DRAFT BEER SYSTEM. 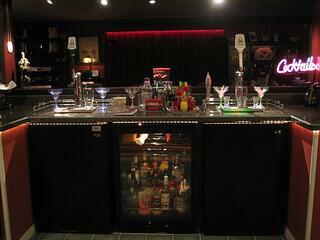 One of our clients recently asked us about the cost of installing a new draft beer system for their bar. Rather than guesstimate, we consulted with our good friends Dave, Charlie and Joe at Draft Profits for additional information on the subject. Draft Profits is a company that designs, installs and services draft beer systems throughout the Front Range of Colorado. The guys at Draft Profits are experts on draft beer systems and even travel around the country educating bar owners. They are some of the most knowledgeable people on this subject who have probably forgotten more about draft beer systems than we'll ever know! As we expected, the guys at Draft Profits were able to provide us with a great deal of information on this subject. We decided this information was too valuable to keep to ourselves, so we’re providing it to you in this blog post. You’ll need to store your backup kegs in a separate walk-in cooler, making it a less efficient system than other options available. Due to these drawbacks, this system is typically used at low end bars. 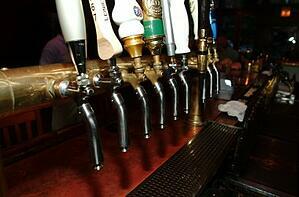 However, it can be a cost effective draft beer system if your bar only carries a small selection of beers on tap. If you need to purchase couplers and regulators separately, they’ll cost you approximately $30 per coupler and $50 per regulator. You’ll also need to purchase a tap system to use with your kegerator. The cost of a basic 6-tap system starts at about $2,500 though there are too many options to list including single taps which are less expensive. As craft beers have increased in popularity in recent years, many bars have started offering a larger draft beer selection to provide their customers with a wider range of options. As a result, 12-tap systems and larger prove to be a better option than kegerator systems for most bars catering to craft beer drinkers. 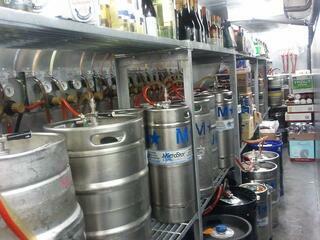 When you use a 12-tap system, the kegs are typically stored in a walk-in cooler due to space issues. Twelve full size kegs take up a lot of room, and it’s more efficient to have a dedicated cooler room for them. In addition, this allows you to keep your backup kegs in the same room, making it much easier to change kegs when they run out. Direct draw system – This is the simpler option, but can only be used if your beer taps share a wall with your walk-in cooler. As a result, this option doesn’t work for most bars since it’s rare for the keg room to share a wall with the taps. But for bars fortunate enough to use a direct draw system, you will benefit from having a short run that will work with a direct air-cooled system. This will keep your costs down. Long run – This is the most common option. Since kegs are kept remotely from the bar, you’ll need a glycol system to keep the beer cold from when it exits the cooler until it pours out of the tap. You’ll also need a tower for this system. The tower will cost about $2,000 for 12 taps, and the drip tray will run approximately $200. Glycol chillers start at $1,000 and can cost as much as $5,000 depending on the length of the run of the lines (this is dictated by the distance from the walk-in to the tap handles). A longer run will require more and stronger pumps, which increases the cost of your cooling system. You’ll also need a trunk line that holds the beer lines and your glycol system. Trunk lines start at $15/foot and may cost more depending on the inside diameter. The longer the run, the more expensive it will be due to the need for a larger trunk line. Overall, these 12-tap systems typically start at $4,000 ($5,500 including glycol) and can cost as much as $12,000 for more deluxe models. As a general rule of thumb, you should expect to pay about $1,000 per beer line. This cost includes a long run, blended gas, and glycol. If you’re using a system that contains more than 12 beer lines, it can be more difficult to estimate the prices. The cost will depend on the unique setup being used at your bar. In these situations, you’ll need to get a specific quote from the company installing your draft beer system. Glycol-dedicated cooling system – Using a glycol cooling system makes sense in almost all situations since it’s the most effective way to keep your beer cold. Air-cooled systems aren’t as effective if you have a long run, so they are only a viable option if you have a direct draw system. Using an air-cooled system with a long run will prevent your beer from cooling properly, and it will result in a lot of foam in your beer. This will cause you to waste a lot of beer because your lines won’t work correctly. It also provides an excuse for your bartenders to give away more beer since you won’t be able to determine whether the beer was wasted due to foaming or simply not rung into your POS system. This will significantly increase your draft beer costs, making it worthwhile to invest in a good glycol cooling system that works properly and prevents your beer from foaming. Foam on Beer Prevention (FOB) – FOB is a special system that helps you waste less beer when you change the taps. In theory, they are fantastic and can be an excellent addition to your draft beer system, but in reality their value depends on your unique situation. If you have a very long run, it makes sense to use them because when your keg kicks, an FOB will prevent the line from filling with foam, an issue that wastes a lot of beer. However, FOBs are somewhat finicky and they must be adjusted every time you change a keg. While it’s not rocket science, you do need some expertise in order to effectively operate the FOB. It would be easy for the owner or bar manager to learn how to do this, but in situations where bartenders are often working on their own, you’ll likely encounter problems adjusting the FOB if your entire bar staff isn’t trained on how to properly use them. Therefore, we don’t consider it a worthwhile add-on option unless your system has a long run. 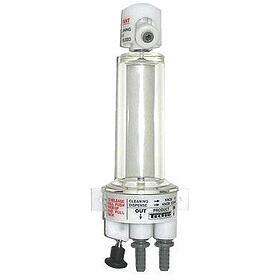 There are 3 or 4 different FOB models ranging from $50 to $100 each plus installation costs. Plastic versions will cost around $50, while higher end stainless steel and glass versions will run closer to $100. There are also some intermediate options that will run in the middle of this price range. Per line pressure regulators – Cheaper draft beer systems will be set up in a zone arrangement. Each zone consists of a group of beer lines, and you can only adjust the pressure of an entire zone. For the cost of $50-$60 for each secondary regulator plus minimal labor fees, you can adjust the pressure for each line individually. This add-on is definitely worth the money since it’ll improve the performance of your system and prevent your beer from foaming. Turbo taps – Turbo taps are very long taps that dig deep into the beer glass. When filling a beer, the turbo tap extends all the way to the bottom of the glass, causing the beer to pour onto itself. This allows you to fill a beer much quicker. Much like FOBs, turbo taps exist for a reason, but only have a very specific use. They are only a good option for high volume bars, stadiums, and other establishments which need to pour beers very quickly. Gas mixers – Direct draw systems can usually use straight CO2 without a problem, but for long draws or when using glycol, you’ll need to use blended gas. The least expensive option is to use a pre-blended system containing 25% CO2 and 75% nitrogen. However, this gas ratio only works well for nitrogenized kegs such as Guinness. Other types of beers such as lagers and ales will go flat with this mixture. The better option is to use gas blenders that will mix CO2 and nitrogen to the appropriate ratio for each beer you’re pouring. In general, a ratio of 60% CO2 and 40% nitrogen (or in some instances 70/30 CO2 to nitrogen) works well for ales and lagers. A ratio of 25% CO2 to 75% nitrogen works best for stouts and other nitrogenized beers. Since these gas blends will be zoned in your system, it’s helpful to know the mix of nitro beers vs ales that you will carry on your tap list prior to installing your new draft beer system. If you don’t know this breakdown in advance, you may need to call the installer to switch out the gas blenders once you figure out your beer selection. Glass rinsers – These are used to spray clean water into the glass to ensure it’s properly cleaned and doesn’t have any residual cleaning fluid in it before pouring a beer. 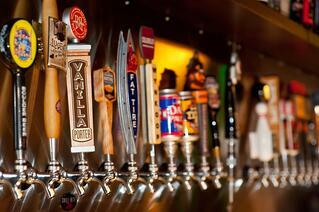 These are a common add-on for bars that serve a large selection of craft beers on tap. If you would like to receive customized recommendations regarding your draft beer system or find out how Bar-i can help you streamline your inventory process and maximize profitability, please contact us today to schedule a free consultation. Bar-i serves clients nationwide from our offices in Denver, Colorado.